Fits 2018+ Honda Odyssey elite 7button Smart Key,protecting your expensive Odyssey key fob from damage, marks, and dust. This item is a cover for your key fob, not the KEY FOB, pls noted. High quality food level silicone material, healthy and safety for you and your kids. This cover can only fit the 7buttons smart key fob, if your key fob is 6buttons Odyssey key fob, then it will not fit, pls check your key fob with the item carefully before you place the order.This cover is full covered protector, it will NOT ALLOW YOU USE THE VALET KEY if you not pull off the cover,also will not slipping off at the same time, pls noted. Sport custom and impressed design, make your car key easy find and look cool, easy to identify your key, never mixup with others. 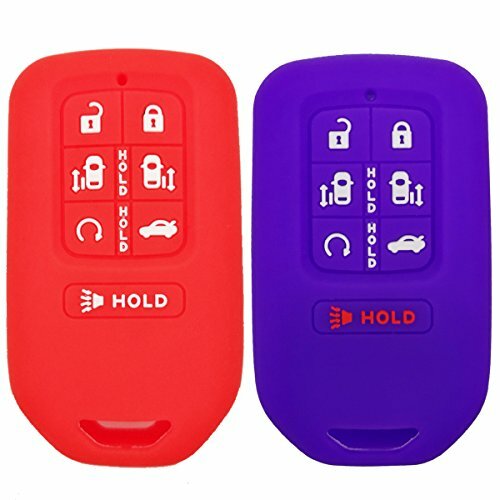 Small insurance for a very expensive Odyssey key fob, buttons still have great feel and work the same.Reduce accidentally push the button without realizing, keep your car safe, necessary accessories for your key fob. If you have any questions about this product by Coolbestda, contact us by completing and submitting the form below. If you are looking for a specif part number, please include it with your message.